Looks on track. Really like the design! 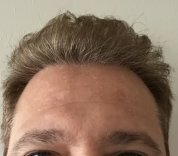 How much time was spent on consultation and design of hairline? Could you also include a pic of donor in next update? Looks good. I don´t understand why you would need 1200 more in the hairline. Maybe if there were some better pictures with better lightning? Nice! I Think it looks really good and the growth hasn´t even started yet. No need to worry about the donor because at least in that last picture with that haircut it blends pretty well. Looking really strong. I think you will get the result you wished for. Ok maybe not very patchy but a little bit. Think it´s also the contrast between dark hair and light skin. Anyway, you just had the surgery and it should improve some when the donor hair gets stronger again from what I heard. I had a look at your first thread and looks like the same pattern there so I wouldn´t think about it for the next 6 months or so. I feel you with worrying more about the donor, especially when wanting the option to have a really short cut. Having the possibility of SMP as a backup plan for the donor is also a relief. Nice, will follow your progress. You don´t think the donor looks very patchy? Looks incredible! And the fact that you can cut it that short in donor area is insane. What is it, 2-3mm something? It´s happening now, can already see big changes from your last posts! The new hairs are getting darker and I think you will notice improvements every week now. How do you feel about your donor now at 3months+ in terms of feeling and looks? Really impressive! The hairline is a little see through so with a second operation it should look outstanding I think. The donor though, wow! Can?t even see any scars at all on the pictures. I?m at 5 months post op and donor is still very patchy so I?m hoping it will recover, yours is looking incredible. Looks very good! Also nice that the donor area seems to be completely healed after the shock loss/scalp issues. Was it the cortisone cream that solved it and did you continue with it? I think at about 1-2 months or something you mentioned some stubble/early growth, did it continue to grow or fall out? Reason I?m asking is that I read about early stubble could be hairs with damaged follicles so that?s why it would stay as stubble in that case. What do you think? Anyway, very happy for you. Must feel awesome to not think about the hair as much anymore, except for which haircut to try next. Yeah I thought it was pretty extreme as well, you can buzz donor after 1 month so was a bit shocked about the 5 month time. If I go for operation I would probably like to buzz it until the real growth has started. Anyway, I should ask them to explain the reason. Read in the Asmed documents that you can?t shave or buzz the recipient area until 5 months. Have they given you any other instruction for this or do you just do it anyway?